How to Structure Your Company for Success. To put it in the simplest terms possible, an organizational structure describes how a company, division, team, or other organization is built; how all of its various components fit together. More specifically, it is a framework that organizes all of the formal relationships within an organization, establishing lines of accountability and authority, and illuminating how all of the jobs or tasks within an organization are grouped together and arranged. Ideally, the type of organizational structure your company, division, or team implements should be tailored to the specific goals you’re trying to accomplish. Because ultimately, even if an organization is filled with great people, it can fall apart (or fail to operate efficiently) if the structure of the organization is weak. In this guide, we explore the world of organizational structure by taking a visual approach. 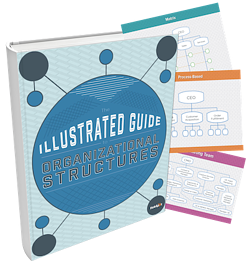 The guide includes several organizational structure diagrams (or “org charts”), which highlight structures that can be applied to entire businesses as well as to marketing departments and teams.